Bringing a farm-to-table concept to restaurants is a trend that is rooted in the values of many restaurant owners and chefs, but it is also based, of course, on what customers are currently demanding. The National Restaurant Association lists locally sourced meat and seafood, locally grown produce, and environmental sustainability as numbers one, two and three, respectively, in its “What’s Hot in 2014 Culinary Forecast” Top 20 Trends list. Advocates and practitioners of the farm-to-table model are usually motivated by wanting fresher, tastier, more seasonal foods, sourced from local farms and producers. They tend to be concerned with the increased use of genetically modified organisms and the disappearance of heirloom varieties of seeds and plants, and are interested in supporting local businesses rather than the conventional, highly centralized growing and distribution system. 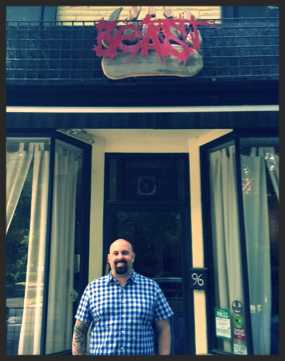 To find out more about how a restaurant offering farm-to-table cuisine operates, I met with Chef Scott Vivian of the Toronto restaurant Beast, which has been one of the pioneering farm-to-table restaurants in Toronto, Ontario. Located on a side street in the downtown area, Beast is a small restaurant with 32 interior seats and 20 patio seats. Vivian previously worked in Portland, Oregon at a restaurant where farmers would come to the back door to sell their wares fresh from the fields. He realized that when he had the opportunity to interact with farmers and get to know them, he could be better educated about how the animals he was buying were raised and treated, as well as what they were fed. He could access the freshest produce and buy what was in season, which, in turn, allowed him to create a product that he was proud to offer his patrons. Vivian says that the most important part of his role as chef is to offer a pristine product — the farmer will ideally be local, but even then, the product must be at its peak, and it needs to be the best product available. When the chef decides to use a specific ingredient, he initially attempts to procure it from an Ontario supplier. If a product from Ontario isn’t available, then he’ll move onto another Canada supplier. If a suitable Canadian product is still not available, Vivian will then consider using a different ingredient for the dish he had in mind. He also keeps the carbon footprint of the food he’s sourcing in mind. In terms of organic foods, Vivian appreciates that some small producers may follow guidelines, but not be certified as organic because of the expense. Therefore, he does not limit his choices to solely certified organic. The front and back of the house staff who work at Beast — currently 12 of them total — go on regular field trips to see where the restaurant’s food comes from, to meet the farmers, and to learn about the foods they’re offering. They have tastings to help them choose which suppliers to use, which foods to offer, and which wine their patrons would like to sip. Vivian looks for farmers who take pride in what they do and in their product. He relays some tips about sourcing pork, saying that a smaller producer has better insight into their products, and can tell him the difference between heritage breeds of pigs — Tamworth versus English Black, for example. Each breed has a different ratio of fat to meat, which helps Vivian decide which to purchase, depending on what he plans to make with it. For fish, Vivian employs the same tactic. He has a relationship with a particular company that offers only sustainable fish and seafood. This takes the guesswork out of ordering, since he knows that anything he orders will be up to his standards for sustainability. Choosing the supplier is one of the most important parts of successfully maintaining a farm-to-table concept. The menu at Beast changes every week, so patrons can enjoy different foods each time they dine. Small plates encourage patrons to try foods they may not typically order, such as Pig’s Ears or Lamb’s Liver. Vivian knows that 80% of patrons who come through his restaurant care about what they eat and where the food comes from, and understand the value of locally sourced food. This gives Vivian some leeway when considering the cost of his menu. To keep his menu fresh and exciting, Vivian travels the world and collaborates with chefs all over to pick up new ideas. He knows that his side street location doesn’t afford him the foot traffic of a main street restaurant, and therefore he can’t afford to be complacent. When asked to predict the next trends in food, Vivian names radishes, broccoli, and the continuation of nose-to-tail cuisine as a few standouts. Implementing a farm-to-table concept can start with a few local selections to test the reaction of patrons, and to establish relationships with local farmers and other producers to help expand the understanding of the food beyond the delivery truck.